I teach high school math, and it is a firm belief of mine that every teacher at any level needs to have a good mix of classes to keep everybody honest and everyone empathetic about the variety of challenges of various student groups. To this end, I have AP Calculus BC followed by a course called Basic Pre-algebra 1. That’s right, let that second one sink in just a little bit. (Don’t get me started on the “we only teach Algebra 1 in high school” soapbox). Utilizing scores and testing data, it became clear to me that, with the exception of two students out of 20, this class needs to be primarily focused for 4th to 6th grade math students. Just over half of the students are special education students, but 15 out of the 20 have an ADD/ADHD diagnosis. However, this is not my pity party, this is just a very good reason to use the flipped learning model. The power of teacher multiplication to allow differentiation. I have used the “In-flip” model that provides instruction, practice, and enrichment components all within the classroom by utilizing technology to provide an independent space within the group space environment. All of this is in an attempt to meet the needs of some of our neediest students. As you would expect,and as I have indicated above, working with the special education staff is crucial to success in this type of classroom. To be fair this is a realization that required some growing into. In education, we like to draw lines and build walls between general education and special education, and the end result in many cases has the unproductive and sad appearance of an army tossing bodies back and forth over the wall. If a kid qualifies for services, “get him out of here” versus “No least restrictive environment”. I have definitely been a part of throwing more than a few special education students over the wall into self-contained, not because that is what is best for the student educationally, socially, etc. but because they did not fit the homogenization that I insisted for my classroom. I can assure you this was selfish and wrong with me. 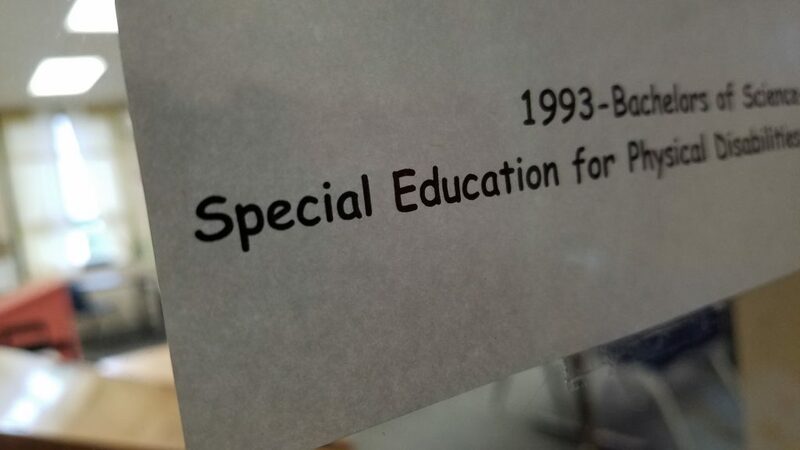 There were a couple things that changed my position on special education. The first of which is flipped learning and the associate of realization that classrooms are not homogeneous regardless of the presence of special education students. I realized that to teach a classroom homogeneously is, in fact, a detriment to nearly all students involved in the classroom. Now let’s also be clear that I am not suggesting a pie-in-the-sky every student in the classroom has their own learning plan, and that we differentiate to the point that there is no consistency. Every pendulum has two ends, but the key for me was designing a classroom that meets the needs of a variety of students, and can be adapted to the needs of a particular student when necessary for their success. This understanding came to me as part of the conscious design process inherent in flipped learning. A second factor in my transition from general education siege mentality to enlightenment was working with a very good set of special education teachers who were patient, but also shut down their own personal defenses about general education so that we could come together. By calling a truce and lowering our respective defenses, I was willing 2 open up about my ignorance, and they were willing to share their wealth of knowledge. I also came to learn that this also involved many of our special education teachers addressing their fears of math and the general education curriculum. I do wish to thank Miss Austin for her work and support of her students, but also her patience with this general education teacher.